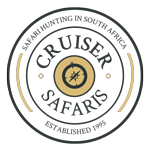 SHOULDER HEIGHT: M - 58" F - 53"
Both sexes posses horns which are very similar to those of a female Cape Buffalo in that they are slightly broadened at the bases and do not contain ridges. They grow outward to the side from the boss and then they curve up and slightly inward. A horn spread greater then the extended top of the ears is considered a respectable trophy. Horns of juveniles grow straight up and begin to grow sideways at about eight months of age. The horns of females are neither as thick nor wide as those of trophy bulls. Wildebeest are herd animals, relying on each others good eyesight, hearing and sense of smell for their mutual benefit and protection. Females and young are found in groups of 10 - 100 animals, while young males form small bachelor groups. Mature males are generally solitary. In areas where grazing conditions and water fluctuates to the extreme, Wildebeest are most active in the mornings and in the evenings. During the hottest part of the day they will seek the shade of tress, where they will stand or lay down. If no shade is available it is not uncommon to find them just standing facing into whatever wind there might be. They may graze on moonlit nights, although normally they will be found lying down. 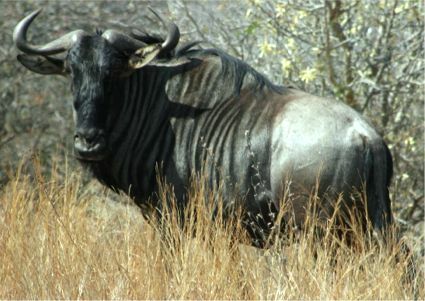 Wildebeest, despite their appearance, are very agile animals. If they are spooked they will instantly take off on a run. They usually don't run far before stopping to look back to assess the situation and then repeating these activities as needed. They will then remain suspicious, watching their trail for long periods of time. Inquisitive animals, they will stand looking at an intruder while snorting and blowing through their nostrils. They will also run around in circles, prance about waving their tails and pawing at the ground. Bulls are territorial, marking their territories with scent and creating rolling grounds. Only males with a territory may mate. Competition between males consists of displays, loud grunting calls and shoving with the horns. Rarely are these fights serious. The breeding season is between April and June. During this time, males establish their territories and round up herds of cows and their young while they fend off rivals. The female does not leave the herd to give birth. 90% of all calves are born within a 3 week period early in the rainy season. Females give birth to a single calf that can stand 5 minutes after birth, is able to run within a couple of hours and can keep up with the herd in 2 days. Although very playful the calves remain in a very close proximity to their mothers, as predators make this a dangerous time for them. Young males are evicted from the herd at 2 years of age.